More than half of all Internet usage is on mobile devices! How does your company’s website look on tablets, iPhones, Androids & iPads? Mobile Internet usage has skyrocketed, surpassing desktop use. 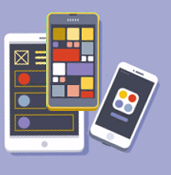 So it is essential that your website looks & functions perfectly on all mobile devices. Additionally, Google penalizes your site’s page ranking if your website is not “mobile friendly” – so it is necessary to make sure your site performs optimally on all mobile platforms. Whether we are building you a new website, or upgrading your existing website, we will ensure that your viewers have the very best user experience on iPhones, iPads, Androids and all makes and models of phones and tablets.